BELIZE CITY, Mon. 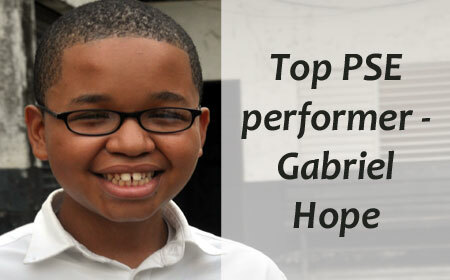 June 8, 2015–Gabriel Hope, 13, of the Bernice Yorke Institute of Learning (BYI), was roused from his sleep at about 4:30 this morning with the news that he had placed first in the 2015 Primary School Examinations (PSE) with 386 of a possible 400 points, or 96.5%. According to preliminary results issued this evening by the Ministry of Education, Hope was followed by Carrel Moralez of San Narciso, Corozal, who received 380 points, or 95%; and Sahil Hotchandani of Belize Elementary School, who received 379 points, 94.75%. Hope told Amandala that he was sleeping when his sister woke him up and said his mom, Zoila, was on the phone. It was his mother who broke the news to him. Hope told us that he was shocked, and it took a while for it to settle in. Hope attributes his success to hard work and preparation. He told us that when he sat the exam, he prayed and made an effort to remember as much as possible. His father, Kevin Hope, Chief Technology Officer of Belize Telemedia Limited until the end of last month, helped him prepare for the math section of the exam, while his mom helped him prepare for his bigger challenge – English. He told us that an aunt in Corozal also helped him prepare for the PSE. According to Hope, his Standard 6 teacher, Sherry Ali, kept back the class every day to prepare them for the PSE. He said that Ali’s teaching helped not just him, but 6 of her other students who ranked among the top 25, to excel on the exam. Hope said that as the PSE exam drew near, they did a mock exam almost every day, and in the evenings when he got home, he studied as much as he could. Hope said that a couple days ago, he got accepted to St. John’s College. Hope was among over 7,000 who sat the PSE on March 23 and May 24, 2015. A total of 7,325 candidates were registered to sit the exams, a decline of about 7% when compared to last year. However, only 7,223 candidates, including 25 private candidates, sat all or part of the exam. Students are tested in four subject areas: English, Mathematics, Social Studies and Science, based on the national primary school curriculum. The grade brackets are A – excellent: 80-100%; B – competent: 70-79%; C – satisfactory: 60-69%; D – adequate: 50-59%; and E – inadequate: 49% and below. Students performed the best in Science, with the most frequent score being an “A,” the grade received by 30% of those who did the exam and which represents an excellent performance on the part of those students. Meanwhile, the most common score for English and Math was an “E,” which represents inadequate performance. For Social Studies, most students earned a “C” grade, which represents a satisfactory performance. Overall, primary school students performed at an adequate level for all subjects except Math, for which the average national performance has been falling consistently for the past three years. The official release from the Ministry of Education expresses concern that approximately half the students got a grade of 49 or less on the Math portion of the exam. However, of note is that there were 200 more “A’s” on Math this year than in 2014, marking a major increase of 32% in the number of students receiving the top grade. 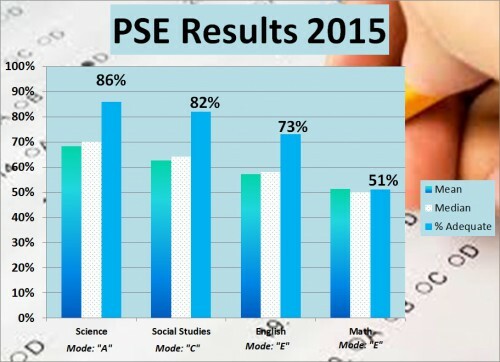 According to the Ministry of Education, PSE scores have been relatively stable over the last decade, with a slight upward trend in each subject. The Ministry of Education, Youth and Sports says that it is about to launch the Education Quality Improvement Project (EQIP) with a BZ$20 million loan from the Inter-American Development Bank (IDB). The project “will focus on improving the teaching of English, Mathematics and Science in schools across the country” and “will also strengthen the pre-service training of teachers in these areas by working with teacher education institutions and teacher educators across the country,” the Ministry says.